This engaging, open-ended writing center will keep your students busy and focused for days and days on end! This versatile writing center focuses on informational writing and opinion writing. 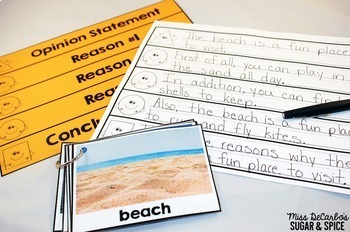 The student-friendly writing templates guide students through the process of writing a topic sentence, details, and a conclusion sentence with consistent visual aides. The best part? 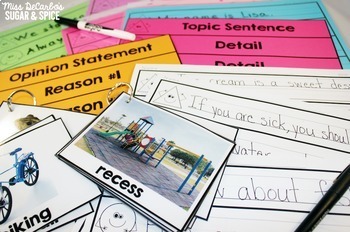 It's virtually NO PREP - just print the cards and place them in your writing center on binder rings or in a bucket for an instant, long-lasting learning station that can be used again and again! Place the writing cards on binder rings, choose the template that best meets your students’ needs, and voila! An instant writing center that can be used over and over again! Or, print the cards and place them in a bucket that students can access. Students can choose to write an informative, opinion, or even a narrative writing piece with each card. Download the preview file to read about the many different ways this pack can be used. This writing center is great for Work on Writing time, writer’s workshop, small group writing practice, and can be even be used to teach and instruct students in whole class writing mini-lessons. With so many choices and possibilities of use, this center is sure to be a big hit in your classroom! 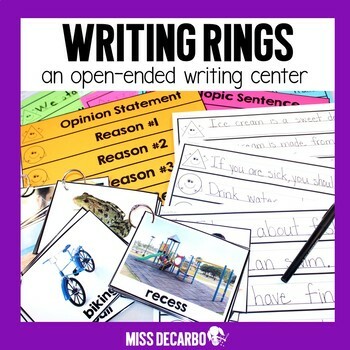 Due to the open-ended options for this writing center, and because of the many differentiated writing printables that are included, this pack can be geared toward kindergarten, first, and second grade writers. Intervention students and special education teachers will also find this writing pack to be helpful in scaffolding and guiding young writer! Download the preview file to check out everything that is included in this writing center pack. 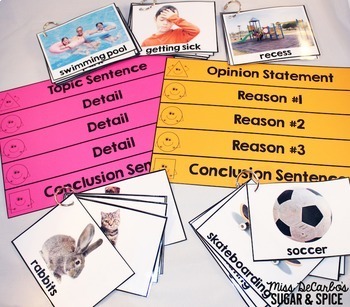 Skills covered while using this pack: writing, informational writing, topic sentences, details and reasons, conclusion sentences, opinion writing, narrative writing, differentiated instruction, writing organization, and creative writing.